One of the appeals of the 200 year old tales of the Brothers’ Grimm is how random events seem connected; as A. S. Byatt says in her excellent essay (online here). They are stories of generic princesses, simpletons, brothers and sisters who meet with good or bad ‘luck’ on their quest, yet are bound by the rules of the fairy tale world – a kind of guided randomness, but usually with a happy ending. Perhaps this is the way children see the world: capricious, a little scary, but ultimately, a hopeful place. When I was a child I loved how the Grimm’s characters met the forces of their fickle, often gruesome, world with kindness and cunning. I’d lay in bed and listen to Danny Kaye’s brilliant reading of Clever Gretel on Sunday morning radio. 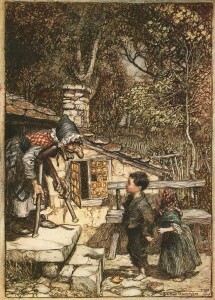 The illustration above is by the great Arthur Rackham (more Grimm illustrations here). Two hundred years ago today, the Brothers Grimm published their Household Tales. One of the appeals of the tales is how random events seem connected; as A. S. Byatt says in her excellent essay (online here). They are stories of princesses, simpletons, brothers and sisters who meet with good or bad ‘luck’ on their quest, yet are bound by the rules of the fairy tale world – a kind of guided randomness – usually with a happy ending. Perhaps this is the way children see the world: capricious, sometimes scary, but in the end, a hopeful place. 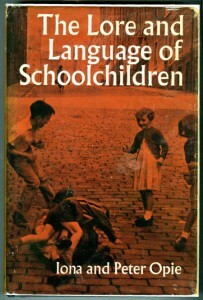 As a child I loved how the characters meet the forces of their fickle, often gruesome world with kindness and cunning. (Illustration by Arthur Rackham; more Grimm illustrations here).